The famous 'onnagata' Mizuki Tatsunosuke (1673–1745) was a male kabuki actor who specialised in female roles. An edict in 1629 banned women playing parts, and eventually only males were cast in roles. 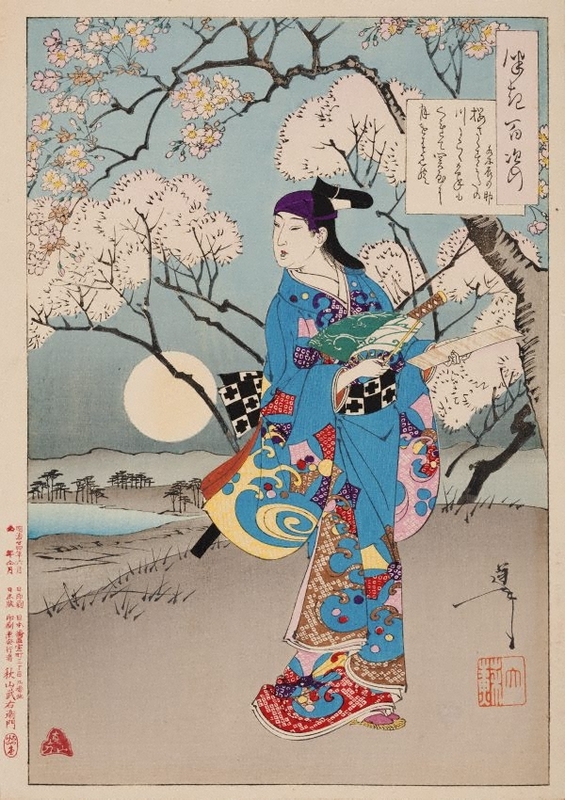 The poem alludes to Tatsunosuke’s journey up the Sumida River to view the cherry blossoms at Sekiya, a village celebrated for its blossoms. Here, the actor is portrayed enjoying the evening along the river with the moon in view. Onnagata shaved their forehead; here, Tatsunosuke wears a purple scarf covering this with an androgynous style top-knot. He wears a bright robe with the feminine sleeves of a 'wakashū', a male prostitute.